Combine water, butter and salt in a saucepan over medium heat; bring to a boil. Once butter has melted, remove from heat and whisk in eggs, one at a time, completely incorporating one before adding the next. Add cheese; stir with a wooden spoon until incorporated well. Add flour; mix well. Mixture should be slightly sticky. Line a baking sheet with parchment paper or cooking spray. With a teaspoon, dollop dough onto baking sheet, leaving about an inch between each. Place in oven and cook for 15 minutes, or until gougeres are golden and no longer doughy. Remove from oven and allow to cool. 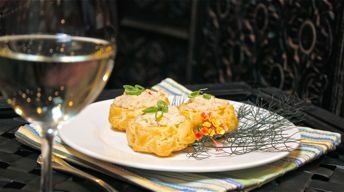 To serve: cut tops of gougeres off and fill each one with crab salad. Note: Gougeres can be made up to 5 days in advance; store in a sealed container and re-crisp in hot oven before serving. Combine all ingredients and season.